Trades are a large part about of makes the NFL draft so exciting each year. One minute you’re hoping a top prospect falls to your team, and the next, the logo flashes on the screen to show that they have moved up and are now on the clock. Teams move down to secure future first-round draft picks giving them even more ammunition in future years while teams move up to secure players they don’t think they’ll be able to draft at their current position. Winning a trade is often viewed as ending up with more than your trade partner, but really it all comes down to whether or not you get what you were aiming for. You might have to give up multiple first-round picks to land a quarterback, but if he leads your franchise for the next decade, you can live with that price. You might land multiple picks by trading down, but if you miss on those picks, the trade for more draft capital won’t be viewed as a success. With that in mind, here are four Round 1 trades over the past five drafts that were a success for at least one of the two teams involved. Had the Bills simply stayed at Pick 10 and drafted White, they would have had a successful first round anyway, but dropping back to pick 27 to land the LSU star means that they are spending less on him over the course of his rookie deal. White produced an elite PFF grade of 92.0 as a rookie, good enough to rank second among cornerbacks behind only Los Angeles Chargers CB Casey Hayward last year. They used the third–round pick to move up to select Zay Jones and while the jury is still out on that pick, the fact that they still have a first-round pick to use in the upcoming NFL draft bodes well for the Bills’ success in this trade. 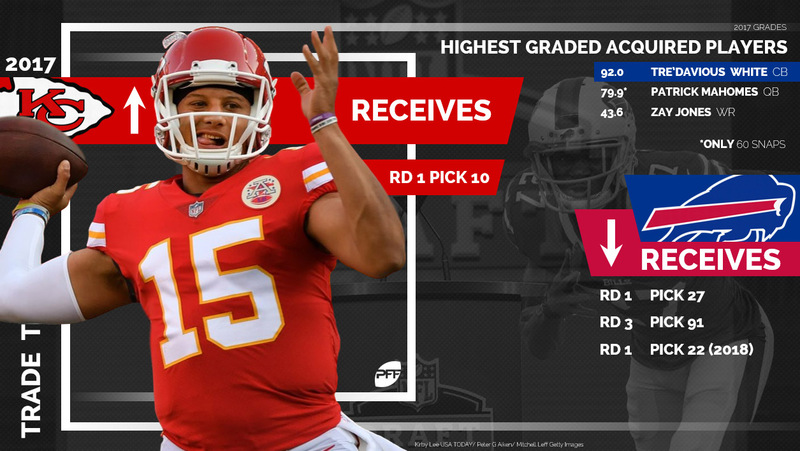 For the Chiefs, it’s currently more of an incomplete grade here, but they saw enough from Mahomes, who produced a PFF grade of 79.9 in his lone start in 2017, that they opted to trade quarterback Alex Smith to the Washington Redskins. There’s a very good chance that this is the type of trade both teams will be more than happy with for a long time. *The Browns also acquired the fourth overall selection in the 2018 NFL Draft via the trade down from what was originally the Eagles’ 12th overall selection in 2017. The Browns continued to ultimately move the picks they acquired for the Eagles, so this is one trade that takes a long time to work out the details of. Ultimately though, Cleveland wound up with nine players, with two more to come at Pick 4 & 64 this year. Those nine players have combined to play 7,530 snaps over the past two seasons, but with Kindred (82.1 PFF grade in 2017) the highlight so far, they really need to nail the two picks this year. For the Eagles, it’s fairly simple. They got the player who they expect to be their quarterback for the next decade. 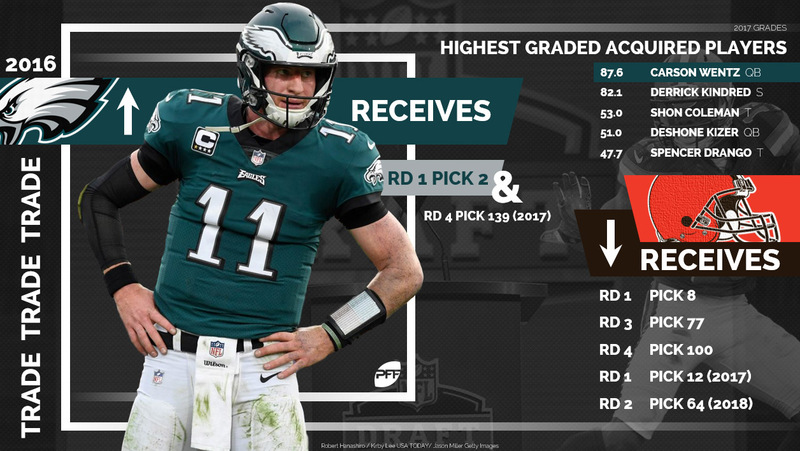 Before getting hurt late in the year, Wentz ranked fifth among quarterbacks with a PFF grade of 87.6, and finished the year tied for third with 10 touchdown passes on throws 20-plus yards downfield. As long as he returns from injury at that level, the Eagles won’t ever worry about what the gave up to secure him in 2016. Harvin didn’t make it through his second season in Seattle, but while the trade didn’t work out overall, Harvin did score on an 87-yard touchdown in the Super Bowl win over the Denver Broncos, so there was at least some positive to come from the trade. That being said, the Vikings will be the happier team with the outcome of the trade. Rhodes has produced PFF grades of 78.0 and above in four of his five seasons in the NFL, racking up nine interceptions and 51 pass breakups in that span. Like his PFF grade, Rhodes has allowed fewer than 650 yards in coverage in four of his five seasons in the NFL, despite often being tasked with defending the opposing team’s top receiver. The downside for the Vikings is that they lost McKinnon to free agency this offseason, but still got the value of the best season of his career so far in 2017, where he forced 43 missed tackles on 233 touches. Atlanta gave up an additional two picks to move up eight spots to grab Trufant, but it is a trade which has worked out well for them. Trufant ranked 19th among cornerbacks in the NFL with a PFF grade of 84.9 in 2017, and has allowed just 57.9 percent of throws into his coverage to be caught since arriving in the league in 2013. There are extenuating circumstances in why some of this trade didn’t work out for the Rams, with Stedman Bailey now assisting at his former school West Virginia after a shooting in 2015, though he does hope to one day play in the NFL again. Ogletree played 4,479 snaps for the Rams over five seasons, but was traded to the New York Giants this offseason, while Stacy hasn’t played a snap since Week 10 of the 2015 season.